Having successfully hidden her power to command the nature spirits that terrorize their islands, Mayara has just married the love of her life, Kelo. But when a spirit storm strikes their village on the day of their wedding, Mayara chooses to save her family and friends, even though it means discovery. Now she will be faced with a terrible choice between renouncing her life and joining the Silent Ones, the island’s police force, or facing the Trial on Akena Island, for a chance to become one of the heirs. Because the islands must always have a queen who can quiet The Deepest Blue, and only those who can survive Akena Island are worthy to take her place. The Deepest Blue is fundamentally a novel about love and family, as well as tradition and change. Mayara is not the first in her family to face the choice. Her sister, Elorna, failed to hide her power, and died on Akena Island, trying to become an heir, shattering their mother’s heart. For this reason, Kelo begs Mayara to choose the Silent Ones, even though he knows this means he will never see her again. To incentivize women to face the trials, only heirs are allowed to have families and personal lives, while the Silent Ones live monastic lives of service to crown. But when Mayara faces her choice, she has no idea whether Kelo is dead or alive, for her to honour her promise. She is caught in a stultifying system of traditions which has ensured that the women who are ostensibly the most powerful in the kingdom must bind themselves into service, and then go on doing the same to their spirit sisters, generation upon generation. Sarah Beth Durst has created an interesting symbiotic magic system, in which the queens and the spirits need one another. The spirits create the very lands which humans inhabit, and the plants that give them shelter and food, but left unchecked, they will create and create until it tips over into destruction and chaos. The queens rein in the spirits’ wilder impulses, limiting their creation, and curbing their destruction, and the world carries on. But just having that power comes at a social cost; Mayara must either give up her family, or risk her life. And when we meet Queen Asana, current ruler of the islands, the reader quickly sees that even rising to the top of the hierarchy of spirit sisters is not without sacrifices or difficult decisions. And even queens can be controlled. 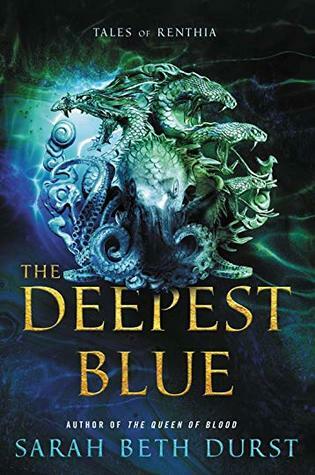 The Deepest Blue is a standalone novel set in the world of Durst’s Queens of Renthia trilogy. Not having read that trilogy, I wasn’t sure how well I would pick up on this novel, but I found that I didn’t need to be familiar with The Queen of Blood or its sequels in order to follow Mayara’s adventures. No doubt there were some references that I missed out on, but I was never confused about what was going on. I did gather that one of my favourite characters, Lady Garnah—Queen’s advisor and chief poisoner—was a crossover from the original books, so I look forward to backtracking to read more about her exploits, as well as the world of Renthia.